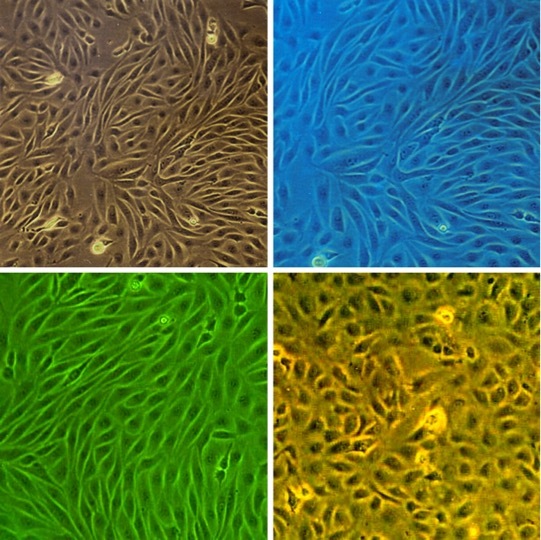 Bovine Brain Microvascular Endothelial Cells (BBMVEC) provide an excellent model system to study many aspects of endothelial function and disease, especially those related to the blood-brain barrier (BBB). (Click to Enlarge) Bovine Brain Microvascular Endothelial Cells: BBMVEC. Isolated from small cerebral blood vessels. Selvi, E. 2016. Factors impacting the efficacy of cell-mediated drug delivery to the brain via the blood brain barrier. Masters Thesis, Penn State University. Kandimalla, K. 2015. NANOPARTICLES/THERANOSTIC VEHICLES. US Patent Application 20150078995 A1. Mathew, J. 2014. The growth factor effect on endothelial cell dysfunction in the presence of glycated collagen and Aβ peptide: implications for decreased angiogenesis in diabetes and Alzheimer’s disease. Drexel University, PhD Thesis. Agyare, E.K., S.R. Leonard, G.L. Curran, C.C. Yu, V.J. Lowe, A.K. Paravastu, J.F. Poduslo, and K.K. Kandimalla. 2013. Traffic jam at the blood-brain barrier promotes greater accumulation of Alzheimer's disease amyloid-+Ý proteins in the cerebral vasculature. Molecular pharmaceutics. 10:1557-1565. Lisk, C., J. McCord, S. Bose, T. Sullivan, Z. Loomis, E. Nozik-Grayck, T. Schroeder, K. Hamilton, and D.C. Irwin. 2013. Nrf2 Activation: A potential strategy for the prevention of Acute Mountain Sickness: Therapeutic strategy for acute mountain sickness. Free Radical Biology and Medicine. 63:264-273. McCord, S. Bose, T. Sullivan, Z. Loomis, E. Nozik-Grayck, T. Schroeder, K. Hamilton, and D.C. Irwin. 2013. Nrf2 Activation: A potential strategy for the prevention of Acute Mountain Sickness: Therapeutic strategy for acute mountain sickness. Free Radical Biology and Medicine. 63:264-273. Gil, E.S., L. Wu, L. Xu, and T.L. Lowe. 2012. β-Cyclodextrin-poly(β-Amino Ester) Nanoparticles for Sustained Drug Delivery across the Blood–Brain Barrier. Biomacromolecules. 13:3533-3541. Niiya, Y., T. Abumiya, S. Yamagishi, J. Takino and M. Takeuchi. 2012. Advanced Glycation End Products Increase Permeability of Brain Microvascular Endothelial Cells through Reactive Oxygen Species–Induced Vascular Endothelial Growth Factor Expression. J Stroke & Cerebrovasc Diseases, 21:293-298. Prades, R., S. Guerrero, E. Araya, C. Molina, E. Salas, E. Zurita, J. Selva, G. Egea, C. López-Iglesias, M. Teixidó, M.J. Kogan, and E. Giralt. 2012. Delivery of gold nanoparticles to the brain by conjugation with a peptide that recognizes the transferrin receptor. Biomaterials. 33:7194-7205. Soni, V., K. Patel, D. Lakkaraju, and N. Puri. 2010. Protein-assisted drug delivery system for the targeted administration of active agents. Patent Application US 20100330158 A1. Stie, J., and D. Fox. 2012a. Blood–brain barrier invasion by Cryptococcus neoformans is enhanced by functional interactions with plasmin. Microbiology. 158:240-258. Esemuede, N., T. Lee, K. Maier, B. Sumpio, and V. Gahtan. 2011. Lovastatin Inhibits Thrombospondin-1-Induced Smooth Muscle Cell Chemotaxis. Journal of Surgical Research, 168:149-154. Walsh, T.G., R.P. Murphy, P. Fitzpatrick, K.D. Rochfort, A.F. Guinan, A. Murphy, and P.M. Cummins. 2011. Stabilization of brain microvascular endothelial barrier function by shear stress involves VE‐cadherin signaling leading to modulation of pTyr‐occludin levels. Journal of cellular physiology. 226:3053-3063. Blasberg, J.D., C.M. Goparaju, H.I. Pass, and J.S. Donington. 2010. Lung cancer osteopontin isoforms exhibit angiogenic functional heterogeneity. The Journal of Thoracic and Cardiovascular Surgery. 139:1587-1593. Closhen, D., B. Bender, H.J. Luhmann, and C.R.W. Kuhlmann. 2010. CRP-induced levels of oxidative stress are higher in brain than aortic endothelial cells. Cytokine. 50:117-120. Haile, W.B., R. Echeverry, J. Wu, and M. Yepes. 2010. The interaction between tumor necrosis factor-like weak inducer of apoptosis and its receptor fibroblast growth factor-inducible 14 promotes the recruitment of neutrophils into the ischemic brain. Journal of cerebral blood flow and metabolism. 30:1147-1156. Pyrgos, V., D. Mickiene, T. Sein, M. Cotton, A. Fransesconi, I. Mizrahi, M. Donoghue, N. Bundrant, S.-Y. Kim, M. Hardwick, S. Shoham, and T.J. Walsh. 2010. Effects of Immunomodulatory and Organism-Associated Molecules on the Permeability of an In Vitro Blood-Brain Barrier Model to Amphotericin B and Fluconazole. Antimicrobial agents and chemotherapy. 54:1305-1310. Gil, E.S., J. Li, H. Xiao, and T.L. Lowe. 2009. Quaternary Ammonium β-Cyclodextrin Nanoparticles for Enhancing Doxorubicin Permeability across the In Vitro Blood−Brain Barrier. Biomacromolecules. 10:505-516. Kandimalla, K.K., O.G. Scott, S. Fulzele, M.W. Davidson, and J.F. Poduslo. 2009. Mechanism of neuronal versus endothelial cell uptake of Alzheimer's disease amyloid β protein. PloS one. 4:e4627. Kuhlmann, C.R.W., L. Librizzi, D. Closhen, T. Pflanzner, V. Lessmann, C.U. Pietrzik, M. de Curtis, and H.J. Luhmann. 2009. Mechanisms of C-Reactive Protein-Induced Blood–Brain Barrier Disruption. Stroke; a journal of cerebral circulation. 40:1458-1466. Agyare, E.K., G.L. Curran, M. Ramakrishnan, C.Y. Caroline, J.F. Poduslo, and K.K. Kandimalla. 2008. Development of a smart nano-vehicle to target cerebrovascular amyloid deposits and brain parenchymal plaques observed in Alzheimer’s disease and cerebral amyloid angiopathy. Pharm Res. 25:2674-2684. Colgan, O.C., N.T. Collins, G. Ferguson, R.P. Murphy, Y.A. Birney, P.A. Cahill, and P.M. Cummins. 2008. Influence of basolateral condition on the regulation of brain microvascular endothelial tight junction properties and barrier function. Brain research. 1193:84-92. Gil, E., and T. Lowe. 2008. Invention of Polysaccharide-based Nanopa rticles for Enhancing Drug Permeability across the Blood Brain Barrier. NSTI-Nanotech, 2:379-381. Kuhlmann, C.R.W., M. Gerigk, B. Bender, D. Closhen, V. Lessmann, and H.J. Luhmann. 2008. Fluvastatin prevents glutamate-induced blood-brain-barrier disruption in vitro. Life sciences. 82:1281-1287. Yang, H., S. Lopina, L. DiPersio, and S. Schmidt. 2008. Stealth dendrimers for drug delivery: correlation between PEGylation, cytocompatibility, and drug payload. J Mater Sci: Mater Med. 19:1991-1997. Colgan, O.C., G. Ferguson, N.T. Collins, R.P. Murphy, G. Meade, P.A. Cahill, and P.M. Cummins. 2007. Regulation of bovine brain microvascular endothelial tight junction assembly and barrier function by laminar shear stress. American Journal of Physiology-Heart and Circulatory Physiology. 292:H3190-H3197. Erdogan, A., A.K. Most, B. Wienecke, A. Fehsecke, C. Leckband, R. Voss, M.T. Grebe, H. Tillmanns, C.A. Schaefer, and C.R.W. Kuhlmann. 2007. Apigenin-induced nitric oxide production involves calcium-activated potassium channels and is responsible for antiangiogenic effects. Journal of Thrombosis and Haemostasis. 5:1774-1781. Kuhlmann, C.R.W., R. Tamaki, M. Gamerdinger, V. Lessmann, C. Behl, O.S. Kempski, and H.J. Luhmann. 2007. Inhibition of the myosin light chain kinase prevents hypoxia-induced blood–brain barrier disruption. Journal of Neurochemistry. 102:501-507. Tang, Y., T. Han, M. Everts, Z. Zhu, G. Gillespie, D. Curiel, and H. Wu. 2007. Directing adenovirus across the blood–brain barrier via melanotransferrin (P97) transcytosis pathway in an in vitro model. Gene Therapy, 14:523-532. Colgan, O. 2006. Factors affecting microvascular endothelial tight junction assembly and barrier function in the blood-brain barrier. Dublin City University, PhD dissertation. Motz, G.T., M. Zuccarello, and R.M. Rapoport. 2006. Alkaline pH-Induced Extracellular Regulated Protein Kinase Activation in Brain Microvascular Endothelial Cells: Differential Effects of Tris and Lowered CO2. Endothelium. 13:313-316. Niiya, Y., T. Abumiya, H. Shichinohe, S. Kuroda, S. Kikuchi, M. Ieko, S.-i. Yamagishi, M. Takeuchi, T. Sato, and Y. Iwasaki. 2006. Susceptibility of brain microvascular endothelial cells to advanced glycation end products-induced tissue factor upregulation is associated with intracellular reactive oxygen species. Brain research. 1108:179-187. Kitamuro, T., K. Takahashi, K. Ogawa, R. Udono-Fujimori, K. Takeda, K. Furuyama, M. Nakayama, J. Sun, H. Fujita, W. Hida, T. Hattori, K. Shirato, K. Igarashi, and S. Shibahara. 2003. Bach1 Functions as a Hypoxia-inducible Repressor for the Heme Oxygenase-1 Gene in Human Cells. Journal of Biological Chemistry. 278:9125-9133.